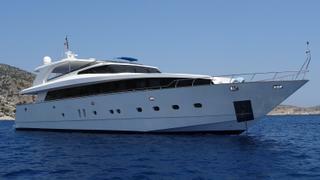 The 36 metre motor yacht Azure Sky has been sold with Eliad Hagiladi at Yacht Marine acting for the seller and the American buyer. Built in epoxied mahogany by Turkish yard Ses Yachts to a design by Sefer Yildirim, Azure Sky was delivered in 2005. A minimalist interior has accommodation for up to ten guests in five cabins comprising a master suite, two VIP suites and two twins, all with entertainment centres, television screens and en suite bathroom facilities. In addition, a further four cabins sleep up to seven crewmembers. The main deck saloon has two comfortable couches and four occasional chairs, and is separated from the dining area by a central wall that houses a large flatscreen television. With her tenders safely stored away in her aft garage, she also offers vast deck spaces, which are ideal for al fresco entertaining, including a large aft deck with a sofa and varnished table and a large settee. Up on the sundeck are more outdoor dining areas, along with sunpads and loungers, while for dedicated sun worshippers to relax in privacy, there are built-in sunpads on the foredeck. Twin 2,285hp Caterpillar 3512B diesel engines allow a cruising speed of 20 knots, topping out at 24 knots. Azure Sky was asking $2,350,000.